The Bruins are now officially a month into their season and we still have most of our hair as their record sits at a mediocre 6-5 for 12 points. Currently they’re just outside the playoff pack but the good news is that the two wild card teams in front of them (Detroit and Toronto) have just 13 points and the race could stay tight all season. Parity across the NHL has everyone grouped together pretty well in both the Eastern and Western Conference. Outside of maybe the Canadiens, Rangers and Penguins everyone in the Eastern Conference looks beatable to each other. Just like in earlier weeks, last week we all got to see the constant fluctuating of ups and downs that has become a signature of the Bruins. They got 2 big wins down in income tax free Florida against the Panthers and the Lightning and then on Saturday took one on the chin at home from the Rangers. At even strength the Bruins did a nice job of controlling a lot of the play against New York but it was special teams, and two horrifically inexcusable shorthanded goals given up, that gave the game away. What’s worse, the Rangers also tallied a power play goal as well while the Bruins man advantage couldn’t get one themselves. Can We Get A New Third Line? We discussed this in last week’s review that there needs to be changes to the 3rd line and that hasn’t changed. At least last week it looked like Claude is starting to go through his stack of applications for the job. Thursday against the Lightning Matt Beleskey was a healthy scratch giving way for Sean Kuraly to make his NHL debut (the 6th Bruin to do so this year). And Saturday against his brother’s Rangers team, after scoring the game winning shootout goal against the Lightning, Jimmy Hayes was (finally) a healthy scratch. It seems like the message was received by Beleskey. He played much better Saturday night against the Rangers. We will have to see if Hayes receives the same message. Bottom line, players slotted above their pay grade is not helping. Reilly Nash should be on the fourth line. That is where he should be. Not the 3rd line center. If a more productive center moves to that line it could help immensely but that would require Spooner or Backes moving down the depth chart. Last week I recommended this balancing of the lines a little bit. Either way it cannot continue as is if the Bruins want to make the playoffs and rob us with more with $11 Bud Lights. The Bruins have the second worst power play in the NHL (thank you, Vancouver). Not only are they not getting production out of the power play they also don’t generate many scoring opportunities or even momentum. The power play looks stationary. It’s also partly why the Bruins are 27th in the NHL in overall scoring. With the ongoing scoring droughts from the 2nd and 3rd lines it is even more important to get their man advantage on track. At the very least, you cannot give up ugly shorty’s, and against the Rangers they gave up not one, but two. It’s time to clean it up. Part of the third lines issues is the ineffectiveness of Jimmy Hayes. Again, we have said that we feel he is more engaged, and “looks” the part of a guy who is giving more this year. But it’s all about results and there aren’t any. He just does not do enough in the offensive zone, even on the forecheck. Hayes has not scored a friggin’ goal since February 24th. He has not even recorded an assists since that time either. That is 24 games since he’s sniffed a point. We’re almost to the point where we can say with all seriousness that Hayes hasn’t recorded a point since Obama was president. To say things are not going well for him playing for his home town team is an under statement. It’s just such a kick in the nuts when his brother Kevin scores a goal against the Bruins while Jimmy is a healthy scratch. I am not sure if this will ever work in Boston for Jimmy. Maybe there are too many family members. Maybe he is too sensitive and cannot take the outside pressure to produce. The guy certainly has had some success in the NHL before. If the Bruins could find someone to take him off their hands it might be best for the player and the team. Did Tuukka Tweak His Injury Again? In the second period of Saturday night’s game Tuukka made an awkward save on a 2-1 rush. Being at the game you could see the trailing ref skate over and talk to Tuukka and it certainly wasn’t about the weather. It seemed he was checking if he was okay based of the uncomfortable look of Tuukka’s movements. Even on the next wave into the Bruin’s end the ref was still talking to Tuukka. Hopefully he is okay because we saw last week what it looks like without him. It’s a nightmare. And Zane McIntyre will need to play at least 2 games this week as the Bruins head into two back-to-backs during a busy week. ​Pasta is going to be an important member for the Bruins and their growth toward becoming a playoff team. They need young players they’re relying on to develop throughout the season in order to not be one-and-done in the playoffs if they get it in. It was amazing to me being at the game Saturday night at the TD Garden against the Rangers how many Rangers fans that were in the building. The place was just crawling with them. When the Rangers scored there would be a ridiculously loud roar from the crowd and the “lets go Rangers!” chants could be heard throughout the night. At the end of the game you could even hear Rangers fans singing that stupid Rangers song. My one question; how does this happen? Does Jimmy Vesey have 10,000 family members in the Boston area? How do Bruins fans allow this to happen on a Saturday night? This is not a good look for the Bruins and their home ice advantage if other team’s fans are going to be in the building in large numbers. Next thing you know they’ll try to take over the whole damn city and put us out on the streets. Last season the Bruins were one of the best road teams in the league. And this year they’re right back at it with a 5-2 record away from the Garden as well. However at home they’re 1-3 and have only scored 5 goals total in their 4 home games this season. They’re continuing with the same theme as last year where the B’s home record put them at 26th in the league. 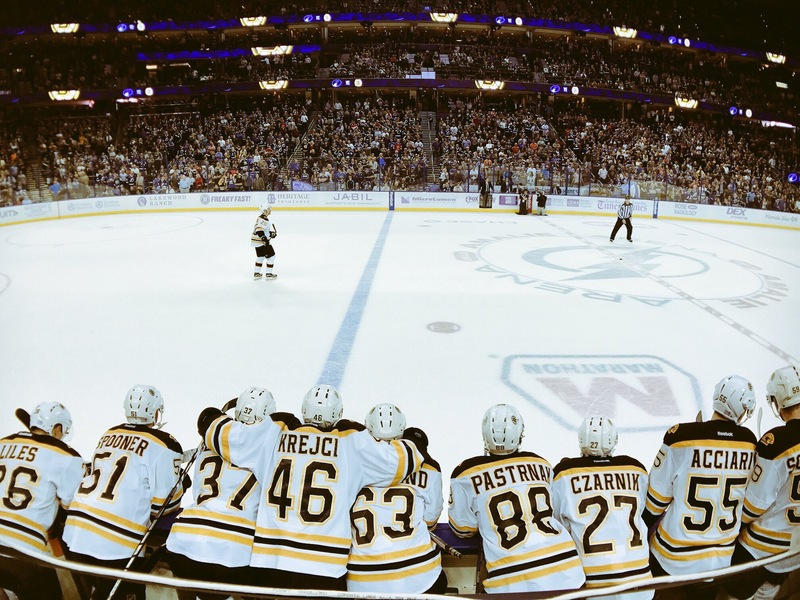 The TD Garden is no longer a place visiting teams struggle to play in. Especially the Montreal Canadiens. Normally we can look past some bumps in the road as teams usually work through them. But this isn’t a bump anymore. It’s a sink hole. It has now become the norm. I’m not sure if they’re too comfortable at home, if the game day routines are getting stale, if they lose that “us against the world” fire being on the road can create, or what. I’m sure it’s frustrating for the players and doubly so for the fans who have to fork over big bucks to attend a game. But it’s got to stop. If you can’t be sharp at home on a Saturday night at some point it’ll catch up to you on a miserable Siberian-esque February Tuesday in Calgary or Ottawa. The Week Ahead: The B’s have a busy week coming up with 5 games jammed into just 7 days. You try not to say they’re all must win games but they certainly need to keep pace to not fall too far behind in the standings this early in the season. They play Buffalo tonight at home and then on Tuesday they get their second chance to slay the hated Montreal Canadiens in Montreal. Thursday they’ll return home to take on the Columbus Blue Jackets and then they go on the road to Arizona on Saturday (a game we’ll be attending) and Colorado on Sunday. Other than Montreal this week, this could be a good chance to pick up some wins and get back into the playoff picture to help prevent us all from developing a drinking a problem. Previous Previous post: Can Some One Answer This Jimmy Hayes Trivia For Me?